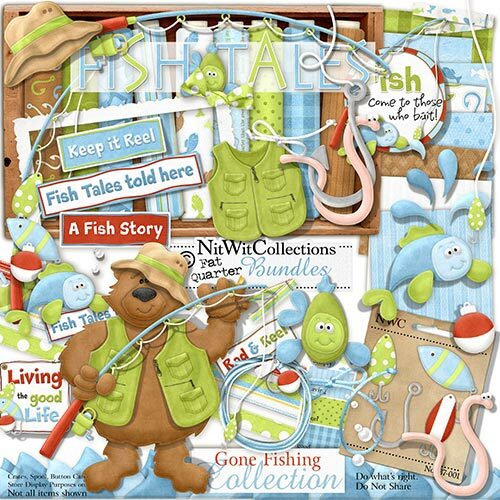 My "Gone Fishing" Collection is yet another in this FQB series! My "Gone Fishing" Collection is a tribute to all of the fishermen and fisherwomen who love to spend their days casting into the waters and trying to outsmart the fish into taking their "lucky" hook! I've tried to pack up your tackle box with the best lures and floats and even gave you some bait, so take the day off and hang out the sign "Gone Fishing"! 1 Bubbles set - which fokelore lake monster is making these? 2 Fish - they're taunting you!! 1 Frame - Fish Tales - there are no tales in fishing, right?